It’s not their job to deport undocumented immigrants. That was the message Tuesday from every police force in Santa Clara County. 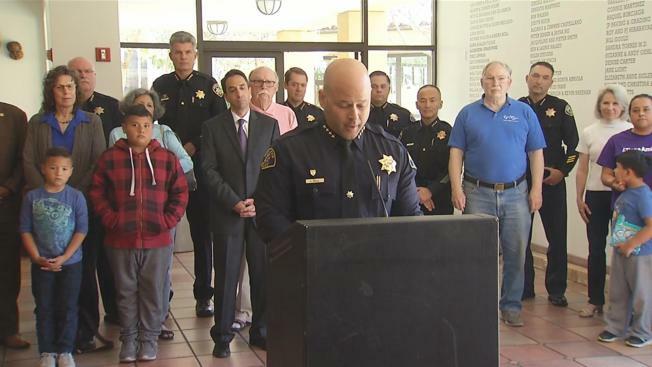 Police chiefs from across the South Bay gathered for a news conference at San Jose police headquarters Tuesday afternoon to speak out in one voice. San Jose police Chief Eddie Garcia said he’s not making a political statement, but he and his fellow chiefs in the South Bay want undocumented families to know officers are not out to get them. "We will treat all our residents with dignity, regardless of status," Garcia said. Speaking on behalf of the Santa Clara County Police Chiefs Association, Morgan Hill police Chief David Swing announced that officers in the county will not enforce federal immigration laws. "Our officers will not detain or arrest any person on the basis of the person's citizenship status or under civil immigration laws," Swing said. "It is not our mission or our role." The policy isn’t new, but Swing said it’s important to remind the community that police can be trusted, no matter what immigration policies the Trump administration makes. "It assures our families that they can trust the police, and they will not work with ICE and deport our families," said Maritza Maldonado of the nonprofit Amigos de Guadalupe. Maldonado said since President Donald Trump took office, attendance at their after-school program has dropped from 35 children to less than 10. She said undocumented families in the program are living in fear. On Tuesday, every police chief in the county came forward to affirm they stand with those families. District Attorney Jeff Rosen supported the chiefs' statement. "Justice doesn’t ask victims for immigration papers, and neither do we," Rosen said.